Why Should You Choose the Ultrasonic Diffusers Over Others? When you use aromatherapy, you will find it refreshing for home or anywhere when you use it with an Ultrasonic Essential Oil Diffuser. This remarkable diffuser is the best by far in today’s marketplace. This particular Ultrasonic diffuser receives reviews of praise for its therapeutic benefits and pleasant aroma. The Ultrasonic diffusers are a special type for dispensing essential oils into the air. Using high frequencies, the unit separates the essential oils into small particles producing a micro-mist that is circulated into the atmosphere in your favorite room. Negative ions are released that give you a sense of well-being, mood is uplifted, and stress is lessened. The mist stays in the room environment for many hours depending on how long you set the timer on the unit. Compared to the cold unit, nebulizer unit, and heat unit diffusers, the Ultrasonic diffuser uses less oil than does cold diffusers. Nebulizers use more oil, and heat diffusers do not do as good a job for therapeutic results. The advanced Ultrasonic diffusers are leaders in the marketplace and for good reason. Ultrasonic diffusers purify your environment wherever you use it and they deliver therapeutic results. The essential oils used in an Ultrasonic diffuser purifies the area, removes offensive odors, moisturizes dry flaky skin, soothes and moisturizes dry sinuses, and is refreshing to mind, body, and soul. There are many reasons for doing just that—choosing an Ultrasonic diffuser before all other diffusers. Diffusers are not created equal, as you will see from the information we have compiled for you below. Use smaller amounts of essential oils to achieve a powerful fragrance result. Purify and deodorize the air you breathe in. This helps allergies, hay fever, respiratory, and asthma sufferers. Improve well-being producing negative ions that communicate with serotonin in the brain known for relieving stress, anxiety, headache, and fatigue. Dispense a mist full of moisture that humidifies the air you inhale. This is a benefit in dry climates or when heat sources operate in the wintertime drying out the air. Air conditioning also dries the inside environment removing the ambient moisture from the air surrounding you. Separate the essential oil particles into micro-particles to circulate with water then disperse into the room area for a micro-fine mist. The Ultrasonic essential oil diffuser is the best of the best in your home, bedroom, bathroom, office, spa, salon, or professional setting. The Cool Breeze Product brand delivers a whisper-quiet cool-mist experience with its dinosaur egg-shaped diffuser that resembles an Easter egg! This unit is very charming for youngsters and teenagers, including adults who want therapeutic benefits from 100% essential oils (not included). This is a 5 in 1 unit: it is a diffuser, humidifier, ionizer, nightlight, and air purifier. The cool-mist method uses no hotness to heat the oils and the plant’s integrity for pure oils is maintained. The diffuser is portable, so take it with you. The 400 mL (6.8 ounces) water reservoir lets you operate the diffuser all night with no worries shutting off when it is out of water so it will not burn up. It also automatically turns off when the lid is removed. It will cover an area up to 500-square feet. Light sleepers or babies who might be ill from a cold will not be disturbed when the unit is running all night. The diffuser/humidifier unit will give the air moisture for anyone with colds, flu, nasal and sinus congestion, allergies, asthma, and stress. Users will also benefit from dry chapped lips, dry skin, and hair. With the breathtaking fragrance wafting through your environment, foul odors will also disappear. The Cool Breeze is a whimsical and beautiful accent with perfect functionality for your home in the living room, in your bathroom for a great spa experience, at the office, in a massage or physical therapist’s studio, a hotel lobby, and professional office settings. It will go with any and all décor with its incredible visual appeal. Enjoy the long-life LED lights that change into 7 different colors. The colors alternate from white, purple, blue, green, orange, red, yellow, and pink, or no light. The illumination is calming and will quiet down a sick infant or child. The cheerful design is sure to charm and captivate everyone! You can set it to one color only or as a nightlight for your child or yourself. The colorful diffuser runs up to 8 hours in the continuous ‘max’ mode at 30 mL to 50 mL (1-1.7 oz.) mist rate per hour for the entire night or 8-hour period. You will find this to have the best diffusion rate in today’s market of aromatherapy diffusers. How great is that? Select from 3 timer settings of 1-, 2-, or 3-hours as you need it to operate for you. The mist also has 3 speeds for dispersing the mist into the air of low, medium, and high. The diffuser can be used without essential oils as a small humidifier for adding moisture into the air if it is dry and to help baby breathe easier while resting or sleeping. This will help with any breathing problems and colds. The vapor mist releases from the flower shape in the top for heavenly delights. Fill the tank with water to about one-fourth-inch from the top. Distilled or purified water is always best for having no minerals from tap water, yet you can use tap water. If there is any mineral build-up, simply wash the water reservoir with dish detergent in water, a cotton swab, and dry. You can also swish rubbing alcohol around inside, or let the unit run with alcohol and water for 20-minutes, rinse, and then dry. Be sure you first remove the cord from the unit and do not let water get into the air inlet hole. For relieving stress, tension, and anxiety, use lemon, orange, eucalyptus, tea tree, peppermint, and especially lavender essential oils in the diffuser. The unit is wonderful in the winter and summertime when air conditioners are running where your skin and nasal passages can become dehydrated. Sit it on top of your favorite furniture and enjoy better air quality immediately. So uplift your mood, improve concentration, allow your spirit energy, and mind to come alive! Plug the A/C adapter into a USA 110/120-Volt outlet or 240-Volt outlet in Europe and countries outside of the USA. The power consumed is 7 to 14-Watts/2.4 MHz. The unit is made in China. Gift-wrapping is available for you, a loved one, or best friend. You will receive a User’s Manual and an 12-month Warranty and a 45-day money back guarantee if you are dissatisfied. The Syntus model number ST150 essential oil diffuser is the ultrasonic type that uses water. Only nebulizer diffusers are ‘waterless’ using just pure essential oils. The Syntus reservoir holds 150 mL (5.1 ounces) of water adding 4 to 7 drops of your favorite essential oil (not included). The fragrant and therapeutic mist will cover 300- to 400-square feet of space. There is no heating element inside the unit releasing only a cool-mist using the fan that is whisper-quiet. The Syntus diffuser is a top selling unit on Amazon.Com® for many reasons. The upper portion of the diffuser is made of plastic PP (polypropylene) and the base is made of plastic ABS (acrylonitrile-butadiene-styrene) and is BPA (bisphenol A)-free. The simplicity of design will harmonize with any décor in your home, office, or spa. The push buttons do not make a beeping sound when you press them. You can set the mist function to run continuously or intermittently. The diffuser will mist for 4 to 5 hours using the continuous mode and about 12 hours selecting the intermittent mode. The intermittent mode shows a green light to mist for 30-seconds pausing for 30-seconds and continue at this rate. The continuous mode shows a red light and will mist until the water is gone, automatically shutting off. The 7 long-life LED (light-emitting diodes) will cascade from one color to another or you can turn the lights off if you prefer a totally dark bedroom with the mist still producing. You can control the light’s brightness as you want. The 4-in-1 unit is a diffuser, a small humidifier, ionizer, and air purifier. The ionizer puts negative ions into the air from the water mist that are very beneficial and healthful to rid yourself of moodiness, anxiety, and overwhelming sadness. The 100% pure therapeutic grade essential oils remove tobacco odors, stuffy air, pet odors, and left over cooking smells. You can use citrus 100% essential oils such as lemon, grapefruit, orange, mandarin, and lime including lavender, patchouli, rose, eucalyptus, ginger, lemongrass, cedarwood, ylang-ylang, sandalwood, marjoram, basil, chamomile, and more, including oil blends and carrier oils. Do not use bath oils in any diffuser because it can clog the tube in the diffuser. Do not use Vicks® VapoRub in this unit—it is rubbed onto the chest. You can use the unit as a mini-humidifier without using any essential oils. This diffuser is beneficial in offices, rooms in your home including the baby’s nursery, bathroom, teenagers room, kitchen, massage and physical therapy spas, hair salons, professional office reception areas, hotels, motels, bank lobbies, and more places wherever you want a delightful fragrance. The humidity helps by adding moisture to dry areas in your room, will relieve dry lips, dry skin, and hands from cold or dry weather conditions. The oils you choose will help with colds and flu symptoms, runny stuffy mucous membranes, and dry hair. Add water to the Max line never overfilling. Purified or distilled water is best to use to avoid plugging up the unit from tap water with minerals. Tap water creates mineral and lime scale build up. If this happens, unplug the unit from the bottom base and wall outlet. Use a little distilled clear vinegar with water and run it through the unit for about 10 minutes and with a cotton swab, carefully clean corners, and rinse thoroughly, air dry, and start using the unit again. Another method is after you use your unit about 3 times, first unplug the unit from the base. Fill the water reservoir up to the Max line with water and one tablespoon of citric acid (sour salt) or two tablespoons of distilled vinegar. Use a cotton swab to clean after letting the mixture soak 5 to 10 minutes. Pour out the solution being careful not to let it get into the air outlet hole on the side. Never submerge the unit in water. Allow the unit to air dry or use a towel to dry it inside and out. Mildew and bacteria will grow in your diffuser if you let water sit inside for days and weeks. Always leave it clean and dry when not in use. The dimensions are 6.42-inches high x 3.94-inches in diameter and weighs about 1 pound. Plug the 5.6-foot UL listed cord into a USA 110/120-Volt, 50/60-Hz outlet at 2.4 MHz, 11-Watts. Users outside the USA can buy a 220/240-Volt adapter on Amazon.com®. The diffuser is not cordless, does not run on batteries, using electric current to operate. Gift-wrapping is available for a loved one, family, friends, and for all special occasions. You will receive the unit, A/C adapter, water measuring cup, User’s Manual, and 1-year Warranty. The unit is made in China. If you are looking for a great looking diffuser with a trendy design, check out this Aromatherapy Diffuser by InstaNatural®. It is super cool and will be noticeable at a glance. The sleek eye-catching design is spectacular. It is the best ultrasonic humidifier and ionizer for any living space. Try it with scented lavender, peppermint, and lemon essential oils for a great experience. The European design is stunning and it has soft blue LED illumination. This good-looking unit adds charm and flair to any space with its contemporary look. It is a genuine functioning diffuser. The noise-free diffuser is simple and safe to use. To clean use a little dish detergent with water and a cotton swab. It will sparkle like new. Simply fill the container with 30-100 mL (1.01-3.38 ounces) of water and add 3-5 drops of your favorite essential oil. Press the power button and it will now start. The cooling fragrant mist makes the environment you are in more aromatic and comfortable. When the unit is full, it will produce the mist for 4-5 hours. It can be used with citrus oils with no problems. Put it in your living room, bedroom, bathroom, office, salon, spa, or any area. Why not put an aromatherapy humidifier in all rooms for a total fragrance all over? The 100 mL (3.38 ounces) water reservoir will cover 250-square feet. It uses DC 24-Volts, 12-Watts, and comes with an adaptor. It is 100% BPA-free (no toxins). The essential oils are not included; however, now is the time to purchase InstaNatural’s Lavender, Lemon, and/or Peppermint essential oils so that they all arrive at the same time. This diffuser will have your environment wonderfully relaxing with the fragrant aroma everyone can enjoy and benefit from. It functions similar to mini-ion humidifiers. It creates a powerful seductive mist and helps people having problems with dry flakey skin, sinus irritations, or a dry cough. Your skin will feel moister in a short time. The LED light stays on. It does not have a switch to turn if off; however, that is a benefit of this unit because the light is soft and calming. It is soothing to hear the water trickling when the room is quiet. This is good to meditate or nap with because it is soothing and adds a measure of comfort. This stylish quality essential oil diffuser also functions effectively as a humidifier. This diffuser adequately covers 200-square feet and can hold 350 mL (11.8 ounces) of water. About 6 drops of essential oil is enough to fill a room with the fresh smell of the oil’s pleasing aroma. It uses Ultrasonic Water-Oxygen Diffusing Technology ensuring that the molecular structure of the aroma oil is not destroyed for realizing the diffuser’s full benefits. The hibiscus design diffuser has a unique elegant shape that fits well in a cozy environment at personal or professional areas. Since the diffuser also works as a humidifier, it eases dry flakey irritated skin, asthmatic conditions, allergies, sinusitis, and other conditions. To get the best results you must use pure aromatic oils. The diffuser will operate for 6 hours when set at 30-minutes on in conjunction with the 30-minutes off mode. It can run for 3 hours when you want it to mist continuously. It has an attractive rainbow light that changes color giving your surroundings a soft dreamy effect. The button that controls the light can control the misting. Cleaning and maintaining the diffuser is very easy. Simply clean it with water, dish detergent, and a cotton swab. The diffuser is very effective in removing the smell of stale tobacco smoke, and other strong odors that you dislike. It is capable of producing a fine mist almost instantly and because of the whisper-quiet technology, it is suitable for bedrooms. The automatic shut-off feature provides complete safety and peace of mind allowing you to sleep without worries at night. It switches off as soon as the water is gone. The device can be used with tap water, another convenient advantage. Do not fill the container to the top to ensure safety. The small, light, and sleek dōTERRA® Aroma Lite Ultrasonic Diffuser allows you to experience the benefits of essential oils that have wonderful therapeutic benefits. By using three to four microns (tiny openings), the diffuser forms a micro-mist in your environment. It is easy to use and clean and this allows you to carry it in your purse or luggage when traveling and it is operable in hotels. This diffuser functions in real-time for 8 hours, depending on how you set it. Four to five drops of the essential oil is enough for 4 to 8 hours of operation. It has 4 mist settings and you will only need to press the power button one time for 4 hours of a continuous mist. By pressing the button for 8 hours, the diffuser will have intermittent bursts with 15-second intervals, then it will mist again in this sequence over 8 hours. During the night, you can use the diffuser without any concerns; it shuts off automatically when the water is consumed. With little to no noise, the soothing LED light creates a relaxing, calming, and soothing ambiance for a peaceful mood. The diffuser has three settings: on, soft, glow, and off. You can either leave the light on or switch it off. The dōTERRA® Aroma Lite can be used in homes and offices, bedrooms, the living room, and anywhere you want to relax and enjoy the benefits of the essential oils. Some oils have healing benefits for skin allergies, anxiety, and stress. Anyone can use it anywhere anytime. Most users love the easy to use dōTERRA® and its small amount of oil for it to run for hours. The adjustable LED light is a benefit since it can be turned on and off when you want it to. In addition, it can be easily cleaned with warm water, a little dish detergent, and a cotton swab—a good feature! The design of the unit requires it to connect to the bottom of the unit after filling. It can sometimes be difficult, yet it is possible with a little patience and practice. This diffuser is 5.5-inches in height and 3.2-inches in width looking similar to a wide candle. It has a simple, elegant, and classy look with a floral pattern on its body. It is very quick and starts diffusing a dense mist of aroma oils as soon as it is plugged in. It can hold 100 mL (3.38 ounces) of water and works perfectly with 1-3 drops of quality essential oil or 5-6 drops of aromatherapy. Included with the unit is 10 mL (0.338 ounces) of lavender essential oil. It can run for 6 hours and has 4 timer settings of 30-, 60-, 120-, and 180-minutes. The BriteLeaf 2-in-1 diffuser will aromatize a room of up to 220-square feet and will cover an office room, bedroom, and smaller sitting areas. Using Ultrasonic Technology with a high vibration frequency of 2.4 MHz it creates an ultra-fine mist almost instantly. The device comes with 6 soothing light options, and each light can be set to high or low intensity, as you prefer. Low intensity can be used for a good night’s sleep because it works as a soft night light and helps to induce deep sleep. You can be sure of complete safety and peace of mind with the BriteLeaf 2-in-1 diffuser-humidifier. It switches off before the water is gone with the help of its automatic shut-off feature. The diffuser effectively humidifies the room just enough to sooth irritated dry skin, sinuses, or a dry cough. Do not expect this 2-in-1 diffuser to work as a full-blown large room humidifier. It is small enough to hide behind the clock on the side table and is considered the best by customers to induce a good night’s sleep. The light of the diffuser can be operated independently and has a separate switch in the diffuser. The container should not be filled up to the top because it will not leave space for the liquid to circulate. When you leave headroom, it helps the diffuser to work fast and effectively. Users love the sound of water trickling down when the device shoots out fragrant vapors. The diffuser shuts down sounding a beep that might wake up light sleepers. This diffuser is a combination of elegant style and ultra-modern technology. It is BPA-free and uses high frequency Ultrasonic Technology to create a fine mist almost instantly. It works well with 139 mL (4.7 ounces) of water adding a few drops of essential oil. The diffuser can run for 4 to 6 hours and can aromatize a room of approximately 220-square feet. Since it uses high-frequency ultrasonic waves, it works very effectively within a short period. You can expect full benefits from your favorite aroma oil because the technology used does not alter the quality of the oil used by heating it. This diffuser comes with 6 rotating LED lights that give it an attractive look and helps create a mesmerizing ambiance in the room. The LED lights can be switched off and whenever you want to restore it back on in the dark, flip the switch. Once the diffuser is switched on, the power button needs to be pressed once to set the color of the light and it can be pressed again to switch the light off. The automatic shut-off feature makes it user-friendly and it is completely safe to be used in a child’s room. You need to have no concerns because the device shuts off before the tank runs out of liquid. It is perfect for daily use all year long. This diffuser uses tap water and it allows you to choose your favorite blend of essential oils as required by you. Cleaning this device is also very easy with a little water, dish detergent, and a cotton swab. Being lightweight, you can take it anywhere. It harmonizes with any décor releasing its cool mist of fragrant aroma oils. BPA-free plastics are as strong as other plastics; it simply does not have the toxins. The Allure Aromatics Aromatherapy Essential Oil Diffuser is a natural air purifier and cool mist Ultrasonic humidifier for relief from allergies, asthma, and dry skin. It pairs up to be an elegant flameless candle with two light modes and an automatic shut off mode. You will never waste money again with aerosol or plug-in chemical room fresheners. This unit provides not only air freshness, but mists a lovely fragrance at the same time. As a humidifier, it reduces allergens in the atmosphere providing allergy and asthma sufferers’ relief. Add any essential oil to the mix for aromatherapy. With its cool mist Ultrasonic technology, you will find this a soothing way to freshen up your home or any other area without chemicals. It is easy to move to other rooms or take with you when traveling. Humidifiers are used to lubricate the nasal lining, and uplift your mood. You will not have to breathe in air that is full of toxins. The unit has 4 timer settings, an automatic shut off and two warm candle light modes for creating ambience. Simply add water and a few drops of your favorite essential oil, not included, and enjoy your refreshing experience. This unit is the best for adding humidity to the air at the same time diffusing fragrant oils into the space. The diffuser has quality materials and has an advanced ceramic disc to guard against oil deterioration preventing the diffuser from not functioning due to oil buildup. To clean your diffuser use a little dish detergent, water, and a cotton swab, or pour a little rubbing alcohol into the reservoir, swish around, and let it air dry. The unit is heat and condensation free. There are 3 light settings—2 ‘warm candle’ light and ‘no light’ modes. The 4 timer settings are 30-, 60-, 120-, and 180-minutes. The reservoir holds 100 mL (3.4 ounces) and shuts off when the water is low. It will cover 250-square feet of space for your enjoyment. 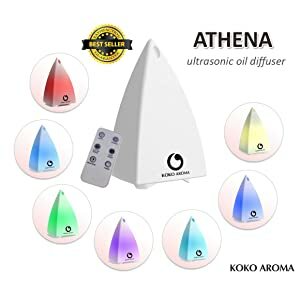 The KOKO Aroma Essential Oil Diffuser uses innovative technology that diffuses unbelievable scents from your oil diffuser purifying and humidifying the air at one time. It comes with a remote control, uses 120 mL (4 ounces) of water, and will run for 6 hours covering a 250-square foot area. This is an Ultrasonic oil purifier, and oils are not included. It has 6 rotating LED lights, is lightweight and stylish for your living room, bedroom, bathroom, spa, yoga studio and more places. You will receive a free eBook when you purchase this diffuser from Amazon. Lift your mood and stimulate your senses with the healing properties of pure essential oils. These oils are known to eliminate stress, reduce anxiety, and help you relax. The KOKO Aroma oil diffuser will do just that! The new Eco technology will give you quiet running and the unit shuts off automatically. Choose your color favorites and fill any area with invigorating scents for creating a peaceful atmosphere that is inviting and elegant. The diffuser provides the aroma mist relaxation and creates happy and healthy feelings. It uses negative ions that lift mood and reduce anxiety and tension. You will have created your own spa experience. Use it as an ionizer, oil diffuser, purifier, humidifier, air freshener, and atomizer. The diffuser process lets you have relaxing aromatherapy and the energizing benefits that are so powerful. It is BPA-free having no toxins. It uses no heat having a cool mist and automatically shuts off. As you know, heat destroys the components of essential oils. The essential oils used in the ultra effective humidifier will help moisturize your skin having it look dewy from the moisture day after day. The Holistic Home™ Essential Oil Diffuser – Cool Mist Aromatherapy Diffuser is key for having a holistic and calming experience. It is stylish, white, and good looking and will fit into any décor. The cool mist with the essential oils, not included, will uplift your mood, reduce anxiety, and aid dry skin, sinus dryness, and dry cough. The same technology used for other high-end expensive units is used by Holistic Home™. Ultrasonic diffusion leaves no rings or mist marks on your furniture. No residue will be left on wood furniture either. The diffuser will shut off automatically when the water has been consumed so you will not need to have any concerns for your safety. This diffuser is great for a bedroom, dining room, bathroom or lounge area, especially in winter when it is dry and stuffy, or in the summer when the air conditioner removes the humidity from the house or building. Humidity is wonderful for health problems such as dry skin, dry and irritated sinuses, a dry cough, or flu symptoms. The misty spray cloud that appears is healthful and beneficial. This cloud is created from the water condensation vibrating. The mist will feel cool when you touch it and the diffuser never gets hot. The oil is not heated like other diffusers therefore, the aromatherapy benefits remain in the oil. The unit has 4 timer settings, 30-, 60-,120-, and 180 minutes, a great convenience. When the water is consumed, the unit will automatically shut off. Pushing the light button changes the LED light colors through 7 different color changes. Use the diffuser for a night light anywhere; the bedroom, or a child’s room. It will give off a soft glowing light that will mellow your mood. Pushing the button one more time and it stays at the color you select. It is made of polypropylene (PP), a durable plastic that is BPA-free with no toxins. It effectively covers 250-square feet. The reservoir holds about 120 mL (4 ounces) of water. The unit runs about 3 hours on one tank of water. The unit comes with a charger adapter to plug into a 110/120-Volt standard outlet. A User’s Manual is included. Comes with a wall charger 2-prong flat plug, so you do not have to worry about using a USB one and having to find a wall adapter compatible with it. Durable and sturdy. I like the design. It has 3 rubber feet on the bottom to keep it stable. It also has a nook where the wire from the adapter can rest in so it will not cause an uneven surface for it to stand on. Has 4 timer settings 30,60,120, and 180 minutes for the timer settings that I like. Has a warm light feature that has 2 settings high and low. Great as a night light near your bedside to set the mood for aromatherapy. Easy to use and clean. We want the brand, Pilgrim® Collection to be memorable to you. Your experience with these breathtaking diffusers, whether the nebulizer using only essential oils, or the ultrasonic type using water with essential oils will be beyond the run-of-the-mill diffusers everywhere. You will love Pilgrim®! Jumpstart your holiday shopping now at Rocky Mountain Oils™, the best quality essential oils brand.